Here’s some sewing projects I’ve finished recently. The fun one was the felt strawberries that I helped the kids make a couple of weeks ago as a homeschool project. They each made a red strawberry and I sewed the pink one as an example. I was really proud of Young Son because he worked so patiently, sewing delicate small stitches the whole way through. Brother rushed more, using bigger stitches, and he completed his first. Sometime back in January or February I made this blanket. I started with a quilt batting that I had saved after ripping the old, worn, fabric off of it. 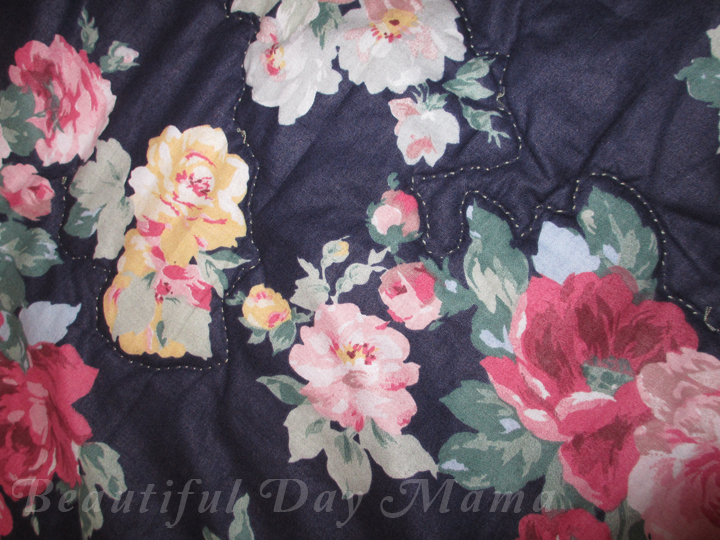 The fabric is navy blue with colored roses – something my mom picked out long ago and not used. I’m not a big fan of the pattern, but I had a lot of it. So, I thought this would be a simple project. I would cut four long strips of the rose fabric and sew it over the quilt batting and I’d use up those materials and have an extra quilt for cold nights. It ended up being so frustrating and difficult – I was near tears several times in the process. The quilt batting was so washed and worn that it wasn’t rectangular anymore, so no matter how I folded and tucked the edges of the fabric on the hem, I kept getting big wrinkles. I couldn’t get the pieces to fit together right. I had to give up on getting it right and just get it done. There were a lot of weird spots on the hem – big tucks and wrinkles. But once it was finished, they weren’t really that noticeable. Then I realized I had wasted a lot of energy stressing over it for no good reason. And I was really proud to have used the batting and fabric that was just sitting around, and I’d turned it into something truly useful. I did some free-form, hand-stitched quilting around the roses in a few random spots to hold it all together. That caused some of the loose fabric to bunch up in places, but once again, it’s hardly noticeable from a distance, so it really doesn’t matter. I like doing free quilting around the visual elements in a pattern. I think it looks cool and it’s fun to do. Last weekend, I sewed two tablecloths. The square one, above, and a longer rectangular one, for when we put an extra leaf in the table. This is another fabric that came from my mother. It is an extra wide, heavier upholstery type cotton. It was the only fabric I had that was wide enough to cover the table without any seams. It was so easy to cut the fabric into two pieces and hem the edges – done! The pattern is growing on me. I wasn’t too crazy about it at first, but it is so nice to have something clean and new.